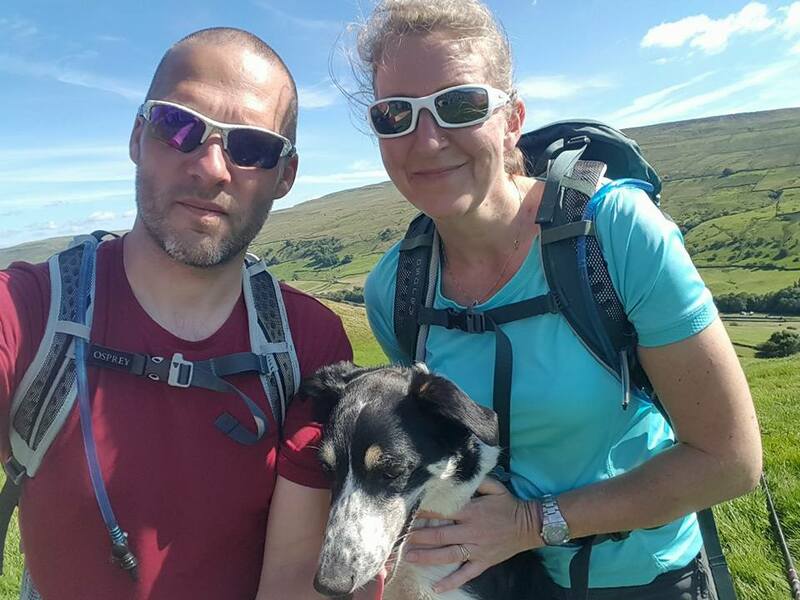 I recently spent 4 days walking the Herriot Way along with my husband Scott and our dog Molly. We started our walk full of cheese omelettes and toast and carrying packed lunches and a little package of sausages for Molly, all courtesy of our lovely hosts. Waterproof jackets were on within 2 minutes but it soon brightened up and we had a dry day with some sun. This section of the Way shares the Coast to Coast route but it was not at all busy. 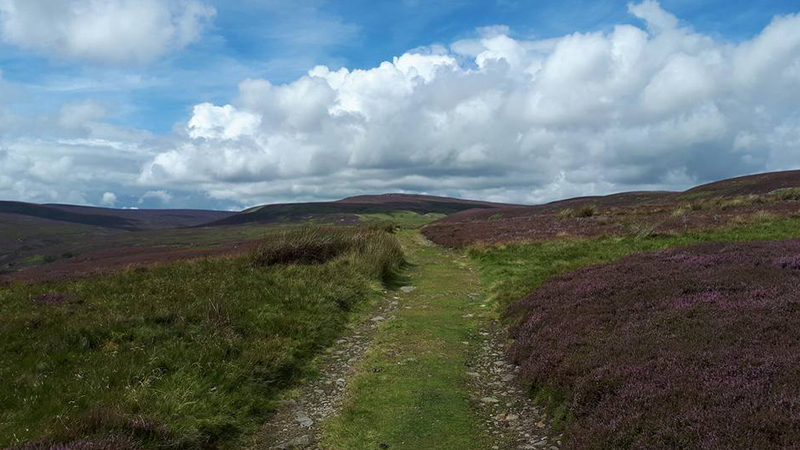 Soon after leaving Keld the path climbs firstly into the bracken and heather covered hillside above Swaledale to the path above Swinner Gill into the heather covered moorland. From here the path climbs further on to the bleak and barren landscape of Gunnerside Moor where there is much evidence of the lead mining industry which ranged across the area for decades. There are abandoned mines, smelting mills and peat stores making this a fascinating place. 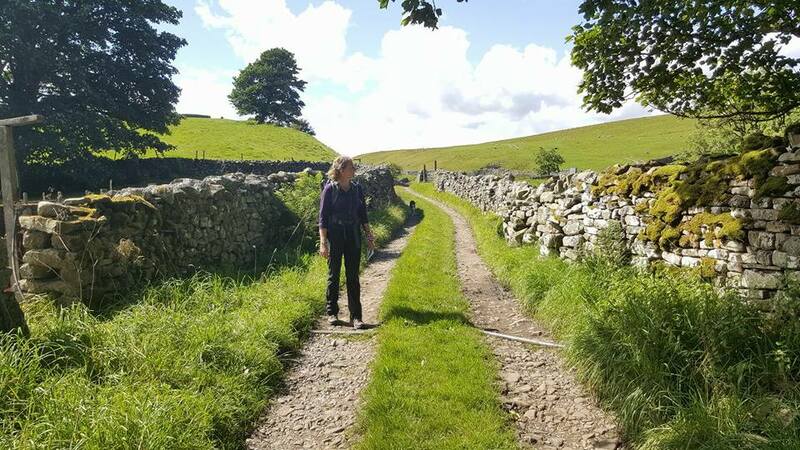 The Way soon returns to the valley through pretty meadows and lanes with the typical dry stone wall and barn landscape of the Yorkshire Dales to arrive at Reeth. By this time I was ready for tea and cake. Day 2 started dry and promising but deteriorated in the afternoon, although this didn’t affect the beauty of the walk. 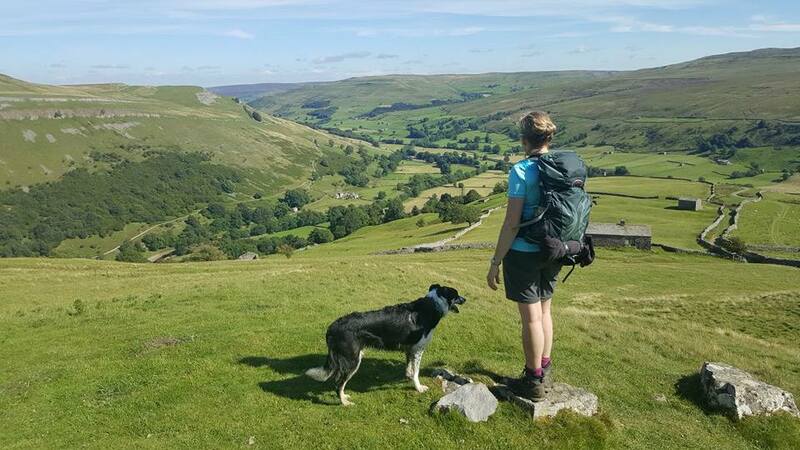 When we left Reeth we had to decide whether to take the shorter high route or the longer lower route, so as the weather forecast was ok for the morning we decided to go high so I could share some pictures of the view. This route isn’t recommended in poor visibility as the path over Greets Hill is indistinct but the views are great in clear weather. After climbing and descending the heather covered moorland of the hill we rejoined the lower route at Dents Houses where there is a handy bothy, useful for a break or shelter in bad weather. Soon after this the terrain changes and we joined a green lane which led us down to Castle Bolton, the impressive remains of the castle coming into view on the descent. There’s a great tea shop in the castle but no dogs are allowed so we bought take-away tea and cake here. 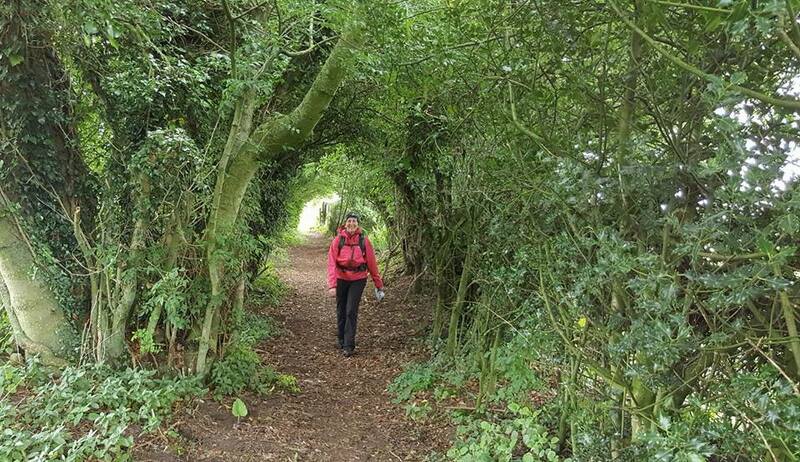 From here it’s mainly farmland and typical ‘All Creatures Great & Small’ views for the walk to Aysgarth which is about 3.5 miles, but the Way also uses Thoresby Lane, an ancient drovers track where the hedges meet overhead in an arch. Before reaching Aysgarth village itself the Herriot Way visits Aysgarth Falls, famous for the scene in Robin Hood: Prince of Thieves where Robin fights Little John. There are three sections to the waterfall and the Middle and Lower falls are accessible by foot. The most impressive part is the Upper falls, visible from a bridge. After viewing these we headed to our hotel in Aysgarth where I enjoyed my wine while Molly lay flat out. Day 3 began really windy and grey but the wind soon blew away the clouds leaving us with quite a nice sunny day. From Aysgarth we passed through fields and over stiles in dry stone walls to the River Ure. We followed the river for a while, then an old railway bed. More farmland followed and we soon saw the village of Askrigg appear. Askrigg is the home of James Herriot, the fictional name given to the real life veterinary surgeon Alf Wight. The TV series was filmed here although in the series and the books the town is a fictional one called Darrowby. The practice was located in a building called Skeldale House and the house used for this on TV now goes by that name. I can vouch for the fact that there are fabulous tea rooms here too! After Askrigg our next destination was Sedbusk but on the way we diverted to see Mill Gill Force, a waterfall that is quite impressive and only a short worthwhile diversion. Back on the Way we passed through more fields and lanes to Sedbusk and from there the path cuts across numerous narrow fields until it reaches Hardraw, famous for England’s tallest single drop waterfall. From Hardraw the route shares the Pennine Way to Hawes so navigation is easy on the paved path through the fields. Soon after we arrived at Hawes and our Inn for the evening with the most amazing shower and fabulous menu. What a lovely day for our ascent of Great Shunner Fell, partly cloudy so a mixture of sun and shade. After leaving Hawes over pasture land and lanes, we soon left the lush grass behind and the terrain became rougher as we joined the lower slopes of Bluebell Hill then on to meet the Pennine Way up Great Shunner Fell. Much of today’s route shared the Pennine Way which is partly paved to prevent the erosion of the peat, making the ascent easy to navigate. The ascent isn’t particularly steep at any point but the downside is that it takes longer. The Lake District has prepared me well, however. The wide-ranging views are fabulous to the surrounding dales and down to Thwaite ahead, our next target. From Great Shunner’s summit shelter at 716 metres there are fabulous views. There is more paved path almost all of the 3 mile descent to Thwaite, where we visited a welcome tea room. From Thwaite to Keld the route climbs over Kisdon Hill via the old corpse road with typical dales views, arriving back at our start point and completing the 52 mile circuit.